CustomMade cofounders Seth Rosen and Mike Salguero are building a one-stop online shop for handcrafted goods. (CNNMoney) -- Almost all of us have a fantasy object in our heads -- a wedding ring, the perfect coffee table, a one-of-a-kind guitar -- we'd love to have crafted exactly to our specifications. But where do you find a producer who can bring your vision to life? Enter CustomMade.com, an emerging player in the artisan e-commerce boom. What began more than 15 years ago as a woodworking site has emerged into a thriving bazaar for all kinds of custom projects. It's like an Etsy where you can customize everything on offer -- and it's caught the eye of influential investors like Google Ventures and First Round Capital. "There's a tidal wave of consumers who're interested in buying specialty items from small businesses, but who just don't know how to find makers, or quality makers," says cofounder Mike Salguero, pointing to an overall U.S. market for luxury goods that tops $178 billion a year. "What we do is make the process easy." Salguero and fellow cofounder Seth Rosen met as Boston University undergrads with a preternatural obsession with made-to-measure shirts. If you could get a dress shirt custom-fitted for you, they figured, why would you ever buy off the rack? 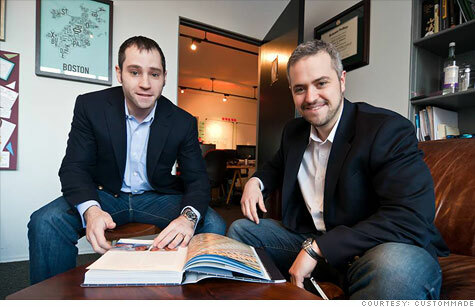 That philosophy led the former real estate developers to the domain CustomMade.com. Founded in 1996 by a Boston-area furniture maker, the site was a marketplace for woodworkers that peaked at a scant 500,000 visitors a year. Salguero and Rosen bought the site in 2009 for $140,000 and set out to expand it into a one-stop resource for connecting buyers with artists who could execute anything from bespoke cat collars to kitchen renovations. That first year, Salguero and Rosen rebuilt the site's interface and logged thousands of miles traveling to woodworking and craft fairs to expand CustomMade's artisan roster, which now includes more than 3,500 jewelers, couturiers, and metalworkers, among others. Potential buyers submit project descriptions that range from the precise -- a diamond-encrusted rapper-style nameplate, say -- to the very vague, like "a white non-wooden desk that snugs into a corner and costs less than $250." Then they wait for bids to come in. A typical post generates up to two dozen bids, many with renderings, and spanning a wide range of price points. CustomMade takes a 7% commission on all sales, funded by the seller. The site now sees 3 million visitors a year and handles $2 million a month in transactions. In late 2011, investors kicked in $2.1 million for an early funding round. That let CustomMade, based in Cambridge, Mass., expand to 18 employees. CustomMade sets itself apart from mass customization sites like FashionPlaytes and craft sites like Etsy by keeping its focus on high-quality artisans, all of whom are vetted. "The typical sales price of something on Etsy is about $25; ours is $1,000," Salguero says. "Our makers are people who do this for their full-time job." Pittsburgh jeweler Paul Bierker is a convert. Though he had a stable client base, finding new customers was a struggle. He joined CustomMade a year ago and now draws 65% of his income -- about $60,000 -- from the site. Each morning, he browses through all the new projects posted and bids on any that fit his style of work. The site's eBay-like reviews and feedback serve as free advertising. "As my reputation increases, my work becomes more valuable," he says. "The consumer protection the site offers allows buyers to say 'yes' to people like me more easily." He's even in the market for an assistant. CustomMade offers a money-back guarantee on all purchases up to $5,000, and its employees moderate disputes, though they say few have come up. A "Creation Stories" feature encourages sellers to post regular updates, including photos, about the progress of a piece. That keeps artists accountable and buyers in the loop. Investors are bullish about the site's possibilities. "We think this has a huge runway to expand into a mass-market product," says Rich Miner, a partner at Google (GOOG, Fortune 500) Ventures. "There are those people already used to getting things custom-made. But then there's a much wider market for whom the story of 'made in America,' being green, will resonate. They don't even know it's possible to do what the site allows them to do." Miner says he hopes to see CustomMade partner with big-box retailers to create custom versions of catalog offerings. But right now, Salguero says his team's main focus is to keep momentum going by helping artists better promote, and appropriately price, their work. The site expects to do $25 million in transactions this year, generating almost $2 million in revenue. "The first step is to continue working on convincing people that getting something custom is both a good value and accessible," he says. "Sure, you can go into Restoration Hardware and buy a great bed, or go to Tiffany and get a beautiful pendant necklace. Or you can find someone who can make you one that's just as nice, and maybe closer to exactly what you're looking for."